Water is very essential to mankind. Most of the health and skin experts claim that drinking water is important to keep the body free of toxins and make you fit. Ayurveda endorses the fact that drinking warm water before bedtime will relieve all toxins in the body. A glass of warm water is the secret to good health and clear skin. An average person loses 3 to 4 liters of fluid in a day. The factors contributing to losing water from the body are sweat, urine, breathing and bowel movements. Proper hydration is essential for good health. You need to make up for the water losses by consuming sufficient water. It is said that hiccups are a symptom that indicates water level is low in the system. Grab a glass of water and yes…you have put a stop to the hiccup. Warm water is nature’s most powerful home remedy and minimizes digestive problems. 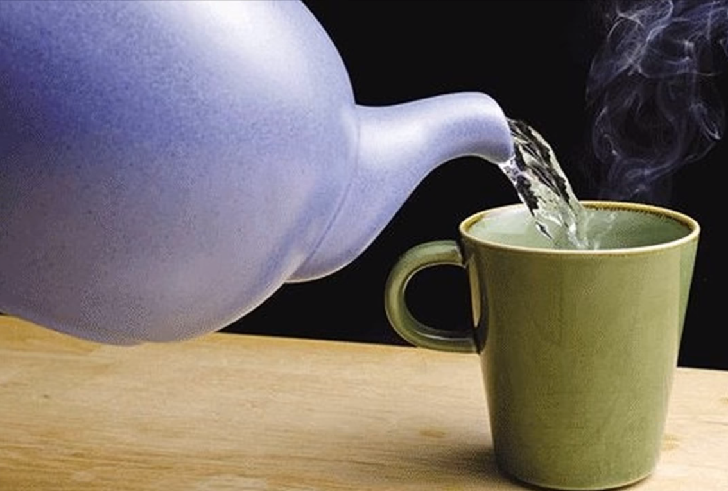 Sipping warm water stimulates proper digestion and circulation, and cleanses the bowels. It also encourages sweating which cleanses the lymphatic system and improves complexion. Warm water flushes the urinary tract, ridding the body of unwanted toxins. The best benefit of drinking warm water is, it is effective in cleansing the body. Your body attracts many toxins, from food, the environment, and other elements. Cleaning it out consistently will help keep it healthy and functioning well. If you are suffering from poor digestion, it can be easily treated by having a glass of hot water twice a day. Drinking water before you go to bed will provide your body with water and the time to clear out your system of unwanted toxins. This will flush out toxins from the body and cleanse the system. Your digestive tract, your muscles and even your skin benefits from the cleansing process. You will feel better, lose weight faster and have more energy during the day. Constipation is a common stomach problem that develops due to water scarcity in the body. The stool deposits in the intestines and reduces the bowel movement causing constipation where passing out stool is difficult and sometimes extremely painful. Drink a glass of warm water early in the morning, preferably empty stomach. Have a glass of hot water empty stomach in the morning to improve bowel movements and cure constipation. Hot or warm water breaks down food particles and passes them out through intestines. Dieticians across the world prescribe to drink a glass of hot water with lemon and honey every day to lose weight. This is definitely helpful in shedding extra pounds. Hot water breaks down fat deposits from the body and helps in weight loss. Have a glass of hot or warm water with either lemon or honey or both, after every meal. Lemon has pectin fiber that controls food craving and is ideal for people who are on alkaline diet. If you are suffering with irritation in the throat or pain , sipping warm water will reduce. It will liquefy thick cough / phlegm and aids in getting it out of your system. Salt mixed with warm water is used for gargling when you have throat pain. People are made fun of when they consume hot tea / coffee in summer. When you drink a hot beverage, you sweat a lot for sometime. Drinking hot water/ tea / coffee lead to rise in body temperature and the water tries to cool down the temperature through sweating. Sweating cleans the skin cells by taking out excess water and salt from the cells and body. You can take pride in having a clear skin. The greatest advantage of drinking warm water is improving blood circulation. When you drink hot water, the fat deposits in the body burns and the built up deposits in the nervous system also breaks down. This improves blood circulation in the body and also flushes out harmful toxins. Drinking a glass of hot water with carom seeds or ajwain is an effective home remedy to cure menstrual cramps. If you have stomach pain, headache or body pain, have a glass of hot water to get instant relief. These are few health benefits of hot and warm water. Ideally, hot water is more effective but, many people prefer warm water on a regular basis. Some people feel full after drinking a small quantity of water. They will have the urge to visit the toilet often. This may be due to weak digestion and insufficient acid production in the stomach. Ayurveda says “It takes a fire to get thirsty.” To increase digestive capacity, drink a glass of warm water before going to bed. You can have a glass of warm water in the morning with a wedge of lime or lemon, a pinch of salt, and a small slice of ginger. A healthy person requires 3 to 4 litres of water per day i.e approximately 12 to 16 glasses of water. The quantity may sound big, but you can schedule this quantity of water consumption by having half a glass of water every half an hour. Your body will get regularized with water intake and you will not feel full and heavy. Too much water also makes your stomach feel bloated and heavy, and overburdens digestive organs. Kidney flushing occurs when the kidneys flush toxins from the blood into the urine, resulting in a higher than normal urine output. In most cases poor digestion can be the source of toxicity. Poorly digested food tends to ferment in the intestines. As bacteria ferment the food, they release toxic metabolic waste products into the gut. The intestines, designed to absorb nutrients, also absorb some of the toxin into the bloodstream. This is a great reason to keep your digestive tract in peak health. There are also herbs that help prevent kidney flushing and reduce loss of fluids.